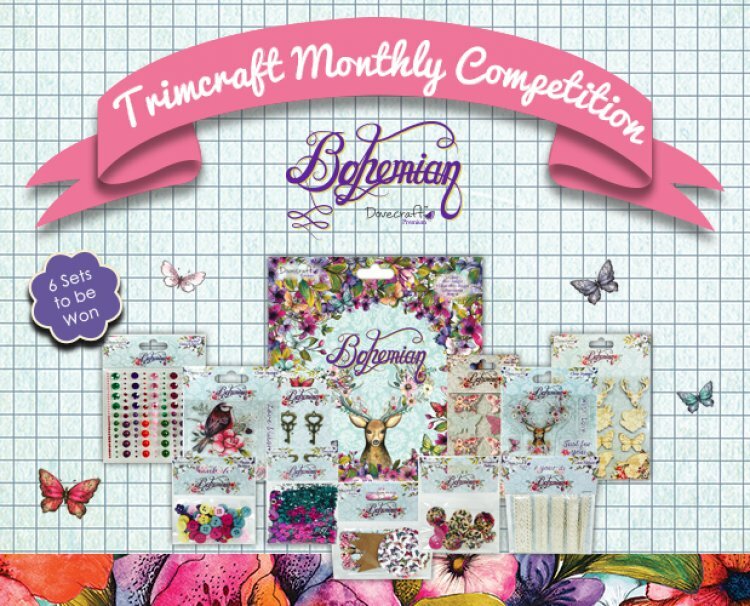 We are offering 6 lucky winners the chance to win the new Dovecraft Bohemian collection including an 8” x 8” paper pad and embellishments such as the wooden frames, sequins, printed butterflies and many more. Lots of Trimmies have already got their crafty hands on the new Bohemian collection and uploaded their beautiful creations on the website, head to the project gallery for inspiration. The charming Bohemian collection features vibrant and delicate hand painted artwork by designer Charlotte Duffy, the on trend papercraft collection contains an array of beautiful floral and wildlife elements to make your craft projects really stand out. All you have to do is log in and click the enter button above. We shall choose the winners on the 30th June 2015.